AN INITIATIVE that involves live video footage from traffic checkpoints bring transmitted to Garda headquarters is being piloted in Limerick city in a bid to curb criminal activity. 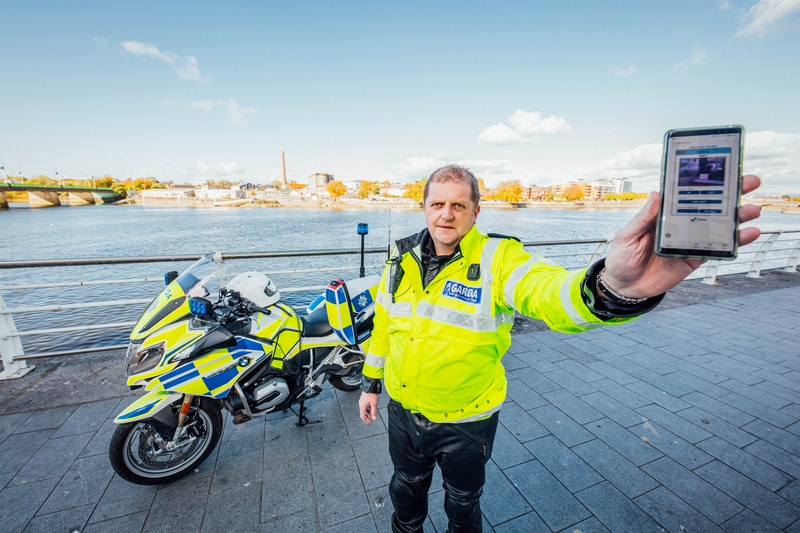 The footage, captured by mobile phone or motorbike mounted cameras by road policing Gardaí in Limerick, is beamed to Dublin through a new Garda mobile app used by members of the units. Video from Garda checkpoints or from pursuits is transmitted directly to Garda headquarters in Dublin’s Phoenix Park. While Garda management is understood to be reviewing the application of the system nationwide, the details of a full implementation is being teased out as the feed has no evidential use in court case as it is not stored or recorded. However it is seen as a significant advance in the Garda’s efforts to detect and prosecute criminal activity. While the initiative was introduced on a trial basis, its implementation across all Garda divisions will require additional funding from the Department of Justice. Garda Bryan Duddy told the Limerick Post that “embracing technology in the context of modern policing is both exciting and challenging. “It will change the future of the way we police and it will increase the visibility and effectiveness of Gardaí on the roads,” he said. Garda Duddy, who is a member of the Roads Policing Unit at Henry Street Garda Station, added that the new technology will greatly benefit traffic policing. The Limerick-based Garda is using a new state-of-the-art BMW RT1200 motorbike which is also equipped with technology that can relay scan number plates of cars. The bike is fitted with ANPR (Automatic Number Plate Recognition) technology which has the ability to scan the registration plates of up to 150 cars in three minutes. The system eliminates the need for officers to call in driver or car details to a station. Aside from the bike’s capabilities in relaying live feed information as well as the ANPR features, the bike can go from 0 to 60kmph in three seconds and and has a top speed of 240kmph. The bike and its technology can be seen this Friday from 2pm to 7pm at the Crescent Shopping Centre.